eProjects: ENC424J600 - nic424 Board in production !! It took me a while but finally the nic424 boards featuring the new ENC424J600 Ethernet Controller from Microchip are in production and available for ordering. 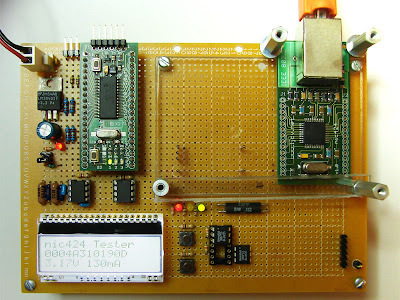 I had the first batch of boards ready for sale but I wanted to expedite and improve the test and validation process, for it then I designed a small customized "tester" using a PIC24HJ128GP202 as the "brains" for it, taking also avdantage of the analog features to measure voltage and current for the device under test. Given the similarities of the nic424 with the nic28 boards, and the fact that I had some extra space on the prototype pcb I was using, I allocated some space and added the test pins for the nic28. Here is an ugly picture (well it's not supposed to be pretty since it's internal stuff) of the finished tester in action. Connection to all the test points are implemented with retractable pogo-pins which are kept in alignment with a small layer of plexy-glass, once the board to test is in place four large hexagonal separator act as nuts to keep the board in place and apply pressure to the pogo-pins for optimal contact. The PIC24HJ128 controls power to the device under test (DUT), and using the ADC module measures the supply voltage to the DUT and supply current using a four-leads current sense resistor that feeds the voltage differential over the resitor to an MCP6022 operational amplifier that connects to one of the analog inputs of the PIC24HJ. The LCD displays the measured values, the DUT MAC Address and together with two push buttons on the side acts as the user interface for several options and parameters of the test firmware. When the test is finished the firmware that uses the Microchip TCP/IP stack, generates a complete test report that as a dynamic web page. If you are interested in additional information about this application or the nic424 feel free to contact me.